If that has been you, read on. Lola was a blue heeler that adopted us rather than the reverse. She showed up on a very, very hot summer day in Oklahoma with temps around 107 degrees. She was obviously starving, little more than skin over bones and very thirsty. I didn’t want another dog, but couldn’t ignore her need. So I allowed the kids to put out some water and food for her. “Can we keep her, Mom?” My youngest two implored. The next morning when we awoke my son went looking for Lola. He didn’t have to go far. She was sitting in our front yard waiting for us. That’s when they named her and I KNEW whether I wanted her or not, she had just joined our family. The funny thing was…she really became my dog and could usually be found sitting under my desk as I worked. Lola was fiercely protective of our family and just as fiercely cautious around others. We could tell at some point she had been abused as she wouldn’t go near other people. Yet she loved us and hadn’t been afraid of us even at the beginning like she was other people. Plus, we were her rescuers. This is a word to the prophet & pioneer. Over the next two years, she was our protector and our yard her responsibility to protect. When the mailman or UPS driver came—let’s just say they were on her turf. We learned we needed to make sure she was put up during their delivery times otherwise Lola would stand in the yard and bark her warning to let them know they weren’t welcome. One afternoon the UPS driver came while my son was out playing in the front yard with her. When he drove up near our home, her protective instinct kicked in and she ran out into the street racing after the truck as my son yelled at her to stop. She didn’t. The driver saw her chasing beside the truck, and then saw her race in front of him, but he never slowed. The impact broke her neck and sent her flying into the air in front of my son. She was gone within minutes. The driver never stopped. The delivery drivers had let us know they didn’t like her and this one simply wanted to get rid of her. They couldn’t see that she simply wanted to protect us—even if she went about it in the wrong way at times. Nor did they care that it was part of her breed and nature to protect and to chase—something we hadn’t been successful in breaking. In the end it broke her. As I thought of Lola this morning, I knew it was more than just a memory that had resurfaced, but a prayer for those who like Lola have taken a severe impact by life and been left broken on the road—while those who inflicted the wound kept going without a second look. You have had people misjudge you, misinterpret your actions and malign you for it. You have asked God why they don’t see your heart as people have written you off, turned their backs or worse attacked you when your intent was simply to help. And you’ve asked God over and over again why does that happen? Prophets and pioneers are often considered strange—different. Because they are different. They move to the beat of a different drummer. They don’t go down paved roads, instead they make roads. They move ahead to take ground, seeing what is not yet seen. Calling it out and into existence—and to the world, sometimes even to the church—they are often strange and unaccepted. Some prophets are called to walk out and demonstrate what God has spoken. Think of Jeremiah. The dude was just weird at times. He was obedient but he was also maligned and misunderstood. Some of you have pioneered hard places with new ways in new seasons and in doing so became a catalyst that has sparked a flame. That flame has simultaneously sparked revival and criticism. Know that there will always be those from past seasons, unwilling to move into the new, who choose to criticize because they unwilling to accept that the new has come. I speak to those especially who have seen this pattern repeated over and over in your life and now your ability to trust is gone. Perhaps it was your own family that turned their back and those you once regarded as friends have walked away. But this isn’t about trust in others, but trust in the One who called you and sent you. It doesn’t matter if at times you didn’t know how, or may not have done it exactly right, He sees and knows your heart—and loves you. This is a message especially to those in which identity has been denied. This is your day of identity. To recognize who you are and who He created you to be. Quit trying to be someone else. Quit trying to fit in, because with some, you never will. You are simply called to be who He has called you to be and do what He has called you to do. 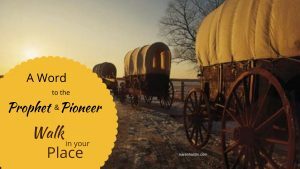 Not all pioneers will be a David. You may be more like Jeremiah, or Joseph—but certainly not a single prophet or pioneer has ever had a smooth road–because remember they make the road. I see the day where, as His prophetic people grow in confidence of who they are, they are able to speak with greater authority and understanding. Do not continue to seek out someone’s approval of your gift, but His approval over your life. As His light shines through you, He will make a way and a place for you. Lola found her place where she was loved and accepted—even if just by our family. With us she was safe and able to do what she was called to do—protect. There is a family for you as well. A place, even if just a small group, who will recognize who you are, love you and help train you. And you don’t have to be afraid for those who would try to break you when you are walking in your place.